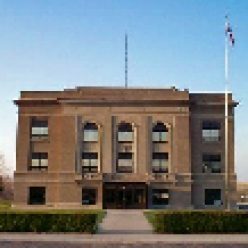 The Register of Deeds Office is the official filing place of county documents. The office issues and files the following: marriage licenses, birth and death certificates, and burial permits; records real estate transactions (including deeds, mortgages, mortgage transfers, etc. ); files financing statements, federal and state tax liens, county welfare and miscellaneous liens, military discharge records, businesses and new business names and coroner records. The office also assists with genealogy research when time permits.